Everyone knows Fixer Upper stars Chip and Joanna Gaines have called an end to their television show Fixer Upper because they wanted to spend more time with their children. What wasn't known...until now...is how many children. The couple just revealed that they’re expecting their fifth child. “I like them ok but enough with the kids already. Their own children begged them not to have any more children on a previous episode already+overpopulation=😶,” wrote one troll. Others accused the HGTV celebrities of having another kid to save their marriage. After the couple announced that season 5 of Fixer Upper will be the last, rumors began to swirl that they were pulling the plug due to relationship problems. But Chip, 43, set the record straight during an October appearance on Today when he explained the decision was motivated by their desire to spend more time with children Drake, 12, Ella, 11, Duke, 9 and Emmie Kay, 7. 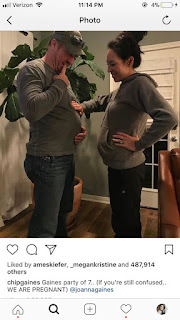 Here's a good rule of thumb -if a baby announcement from a happily married couple makes you angry, there's probably something wrong with you.